I have a confession. As a child, I was the absolute worst when it came to sneaking a peek at my gifts. I would hunt the house endlessly looking for them and when I couldn't find them, I would wait until they were under the tree and I thought no one was looking. Let's just say I became a pro at re-wrapping gifts! The only ones I could never find were the ones that went in my stocking. My mom hid them in an extra special hiding place, and would only fill my stocking after I went to sleep on Christmas Eve. The gifts in my stocking were usually things I hadn't asked for and were always a surprise, so opening my stocking gifts was one of my absolute favorite things about Christmas morning! 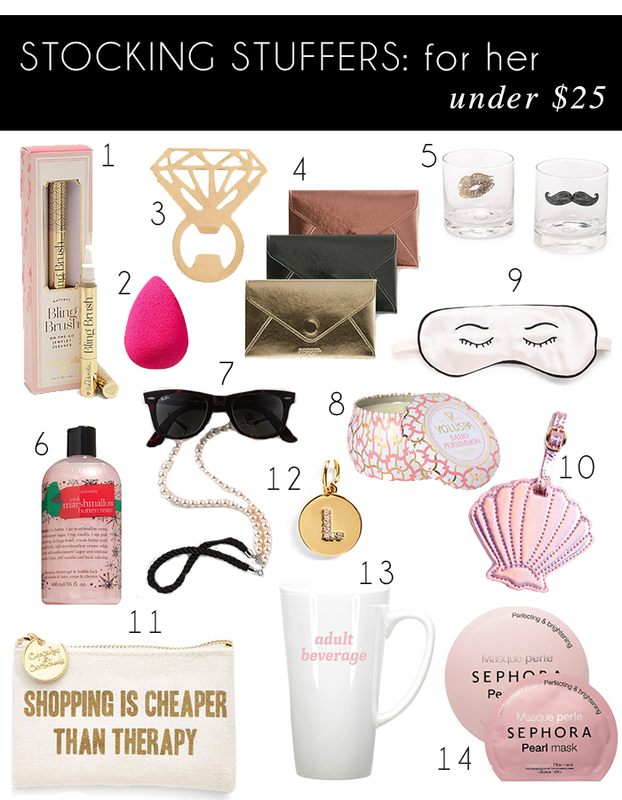 I always have fun shopping for little stocking stuffers for family and friends, and loved making this gift guide because all of these gifts are completely fabulous, under $25 so they won't break the bank, and are a welcomed surprise! Any of these would also make great gifts for girlfriends if you have a larger friend group and don't want to end up with an empty wallet! This would be perfect for the recently engaged friend or girl who just loves her jewelry, and these would be great for your newlywed girlfriend. This coffee cup speaks the language of the sassy coffee lover, and this luggage tag is for your friend who loves all thing mermaid! Whether you're about to finish your shopping or if you're just getting started, stocking stuffers are a great place to start! They're can help you easily cross people off your list and inspire you for your other gift shopping if you're stumped on what to get someone! Happy shopping!